Arguably, one of my ongoing challenges in life is to eradicate the disparity between my taste for the finer things with my income. Hence the reason I pulled up to the bar at Aroma on a recent Friday evening. 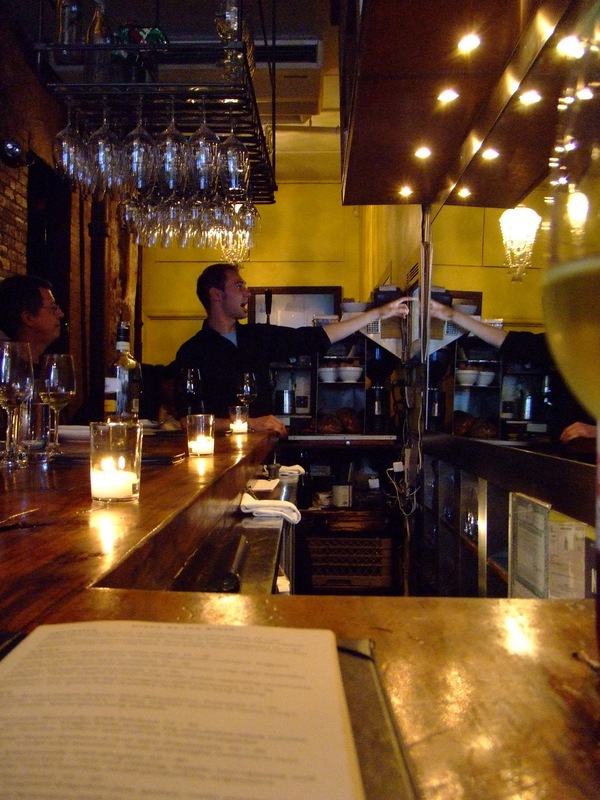 The cozy wine bar and restaurant on a quiet, rather uncharted block of E. 4th St offers a flight of 3 pre-chosen wines for $15, and with that you get unlimited trips to the antipasti bar. I’d had an excellent meal there before, and loved the laid-back vibe and simple, clean décor. This happy hour seemed promising, and better yet, classy. The knowledgeable and generous bartender poured me a flight of interesting whites, including my first ever Muller-Thurgau, a crisp, light, semi-dry wine from Northern Italy. It was so much fun “tasting” wine that I ended up ordering another flight; this time it was a tasting of four wines for $20. The pours began to tip above the half-glass level, and a bonus glass of rose followed. By 8:30PM, long after they had put away the plates of tomato bruschette, artichoke salad, and beets with gorgonzola, I was feeling pretty good. We (by this time my friends Jen and Lucy had joined me) ordered their sicilian meatloaf. 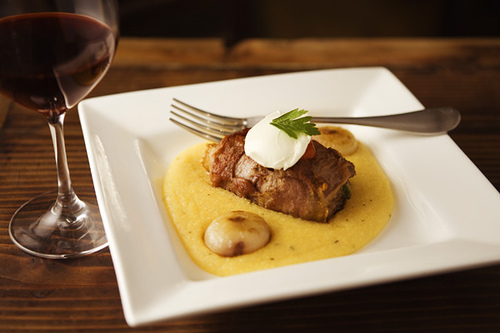 It was fantastic- served over a creamy polenta dotted with cipollini onions and topped with mascarpone cream. Too good. Unfortunately, we had dinner reservations that evening at James in Brooklyn, a restaurant I was eager to try (and wrote about here). Unfortunate because after such a generous happy hour, I was in no condition to review a new spot. What I do remember of James comes in brief, pleasant, quite lucid flashes of memory: a juicy burger, a refreshing ginger fizz, some strawberry dessert, an attractive crowd, soft lighting, and finally spilling out a couple of hours later onto the beautiful, stately tree-lined street where the restaurant resides. By next morning my happy hour buzz was long gone, replaced by an ache akin to someone having batting practice with my head. With certain happy hours, I suppose it is prudent to avoid temptation and keep the happiness to one hour. My other favorite happy hours: Ed’s Lobster Bar, Lure Fishbar. I also love a good prix-fixe…and while I didn’t try this, Aroma offers a 5 course chef’s tasting for $30 (add $25 if you want to pair it with wine and really make it an evening) every Monday night. Sounds like a great deal.